Many models of Chanel Pearl collection have the most beautiful and extraordinary pearls of the world. These pearls come mainly from northern Australia and from the southern coast of China. The south sea pearls are characterised by developing an exceptionally thickness layer of nacre and they have a unique glossy lustre due to the environment they grow. They are white, silver or gold, with subtle, unique and characteristic tones which make them renowned. Akoya pearls, originated from Japan, have been produced for almost a century. The oysters of these pearls are the smallest of the world, for that reason the diameter of Akoya pearls is smaller than the south sea's pearls. Akoya pearls’ colours go from white to cream with yellow, pink or green reflections. Fresh water pearls –which are produced by pearl mollusc that are farmed in China's rivers– offer a wide variety of shapes, sizes and appearance. Fresh pearls could be distinguished from Akoya pearls based on the unpredictable shapes and its extensive colour's palette like white, pink, cream and orange. Fresh pearls are only and exclusively constituted by nacre and they have a soft and warm texture. Tahiti pearls –known as black pearls– derived from the islands of the south sea, in particular from French Polynesia. 2018 Pearl Chanel Collection uses certain models from the French brand as the stars of Chanel. Models such as CH4247H, CH4243H, CH4236H or CH4235H. Through these models it is possible to see the versatility of the models, such as in this case the pearls to some frames with different shapes, adapting themselves to each user, tastes and necesities. These pearls have thickness layers of nacre that surround the nucleus and due to this presents a huge diversity of shapes, diameters, levels of quality and natural shades. The colour’s palette of Tahiti pearls include dark anthracite grey, silver, charcoal colour as well as an extraordinary shades of green like verdigris, anise green, emerald green, forest green and so on. All this great variety of pearls are used in Chanel Pearl Collection designs as the main decorative element both in the sunglasses frames and in prescription eyewear frames. The pearls could be found in the stems or in the front of the glasses. 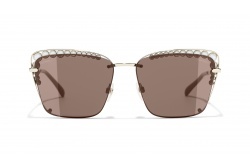 For example, we can appreciate how these exclusive pearls have been assemble over a metallic support in prescriptive eyewear models 3326 and in sunglasses models 5337. To conclude, another Chanel collection which is at the same level as the other master pieces of the brand. Since visual health is our primal concern, with Chanel sunglasses, your eyes will always be protected thanks to UVA, UVB and UVC coatings that are incorporated to all their lenses from factory, blocking a 100% of damaging radiation. 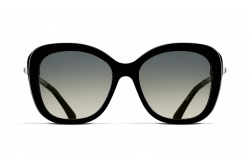 Visit Optical H and find out the best Chanel optical glasses and sunglasses selection.